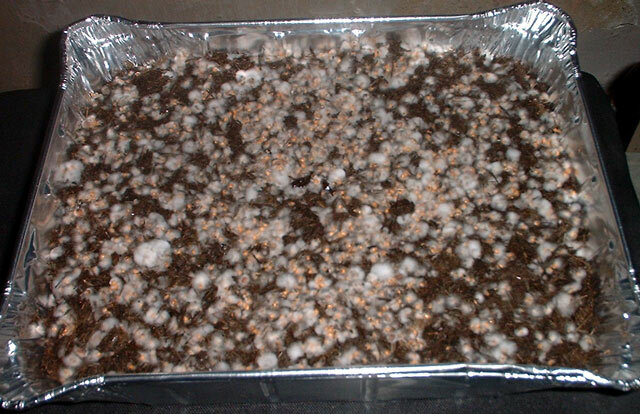 Anyway, the grow log will include a tray of microwave pasteurised horse manure, that will be spawned with a jar of multispore innoc?d Pan trop (cyan?) colonised millet. 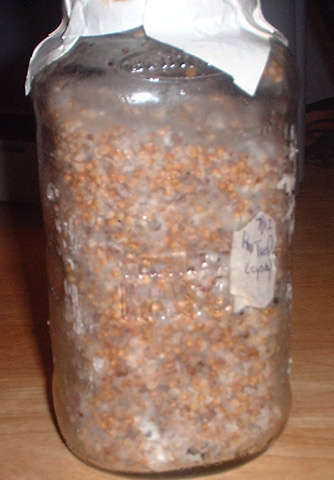 This jar of colonized birdseed was used to spawn a tray of microwave pasteurised horse poo. 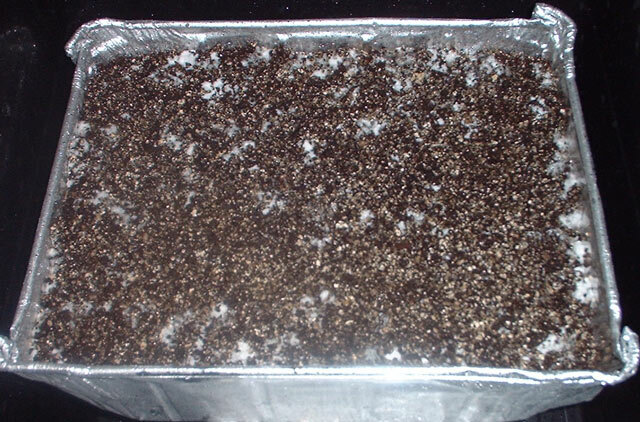 this is about 12 hours after spawning. 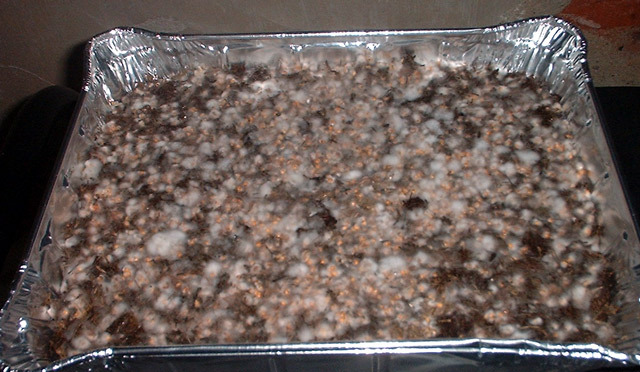 after 3 days in the fridge, a spot opened up in the fruiting chamber. So dude took it out of the fridge, sprinkled a very small amount of casing over a few areas, sprayed, then put into pinset conditions. it shouldn?t be too long now. 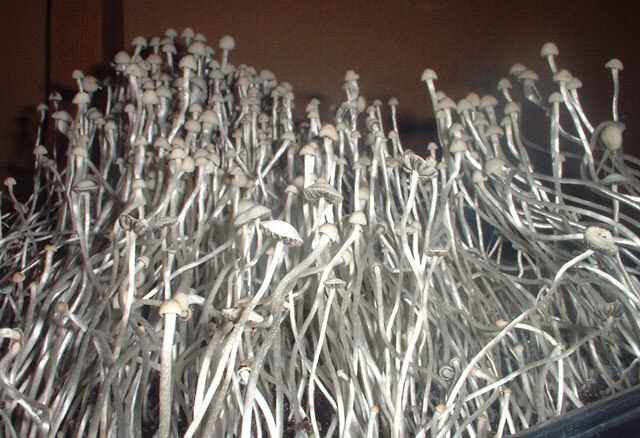 very tiny, but lots of them. Hopefully they will get stockier, because they look pretty petite. This is the best dude has done with this species, so he?s happy nomatter what! Dude said he was too tired to pic the fruits which are ripe now, and will wait till morning and he will take some better pics then too. They are actually fairly nice in size now. I am very happy to see dude get a flush like this, especially after all of the problems they?ve posed in the past, Finally! Looks like you have a good shot at some success there! Political language -true of all political parties- is designed to make lies sound truthful and murder respectable, and to give solidity to pure wind.. So far so good, I'd like to see how these turn out. You seem to be having a lot of success with pasturization of dung using the microwave; just wondering if you could post your method for this. Actually, it is fairly simple. First dude goes out to a horse trail in a local park, armed with a few empty plastic bags. He walks the trail in search of horse doo. He fills up the plastic bags with it, he tries to separate the doo into different bags depending upon freshness. When he gets home, he lays the poo out to dry in their respective piles. Once a pile is completely dry, he brings it inside and begins breaking it up as finely as possible into a microwave safe bowl. After he has a good amount in the bowl, he then adds boiling water to the bowl. It doesnt matter if you add too much. this is allowed to sit for a half hour or so. He then puts the bowl in the microwave for like 5 minutes or so on high. removes the bowl and mixes up the dung. Puts it back into the microwave and nukes for a final 8 minutes on high. 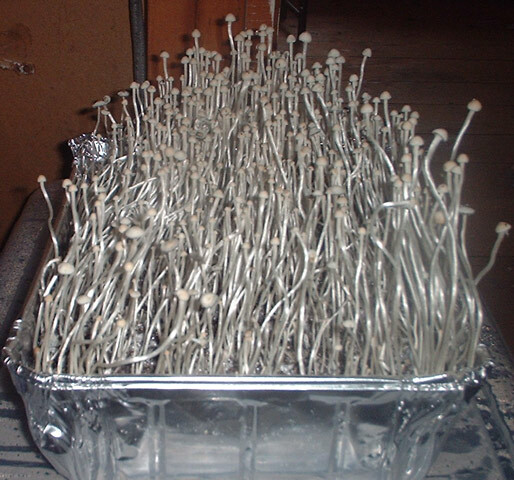 As soon as it stops he places some AL foil on top of the bowl, but leaves it in the micro (with the door closed) to cool overnight. In the morning, he washes out an AL pan and then begins squeezing the dung a handful at a time to remove much of the water and puts it into the pan. After he has squeezed out all of the dung, he spawns it with the desired colonized substrate. The black poo water left over is used to feed his many houseplants. I think that covers everything, if i left anything out, or you have any more q? 's, feel free to ask.. Thanks for the info, I'll have to try this sometime soon and see how it turns out overall. Have you noticed any negative aspects as compared to other methods of pasturization? What is your secret of allways getting such an even pinset? Do you have like 10 identical trays and allways only photograph the nicest? 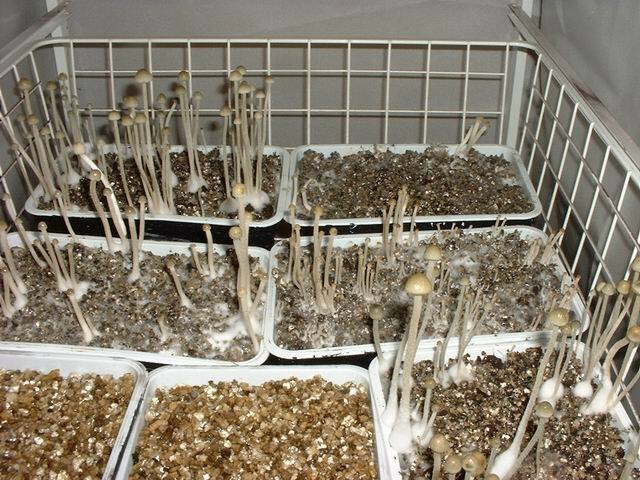 I spawned 3 different panaeolus cyanescens strans to pasteurized cow dung the same day you did. 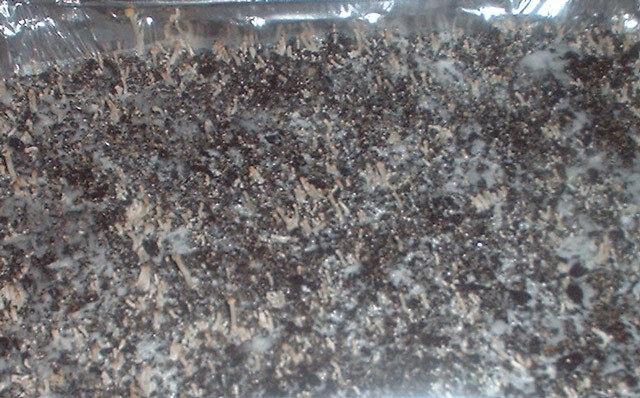 The 2 vermiculite trays are P. cubensis. He tries to match the enviromental conditions as closely as possible, he can read his casing very well IMO. I know you have both of these down. But what I think a very important thing in the process he follows is the cold shock. Every tray he does gets covered with Al foil and holes poked in. 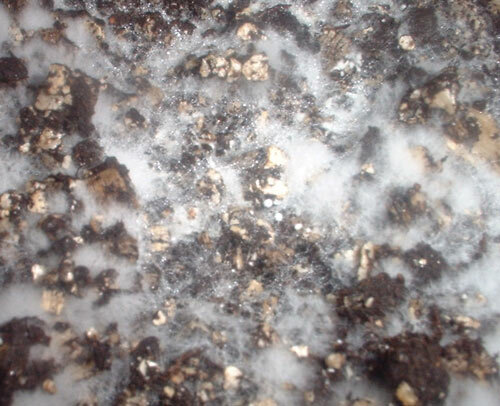 Then when the first areas of mycelium poke through these areas are covered with more casing and sprayed. put back into incubation, then ususally less than 24 hours later they go into the fridge. dude always puts them into a clean trashbag first. 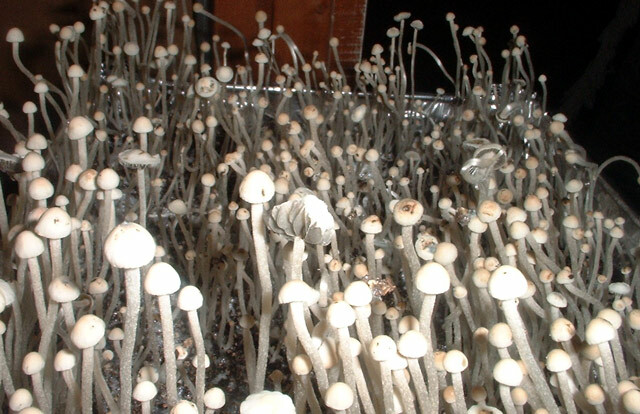 They are left in the fridge for at least 12 hours, sometimes as long as a week(depending). 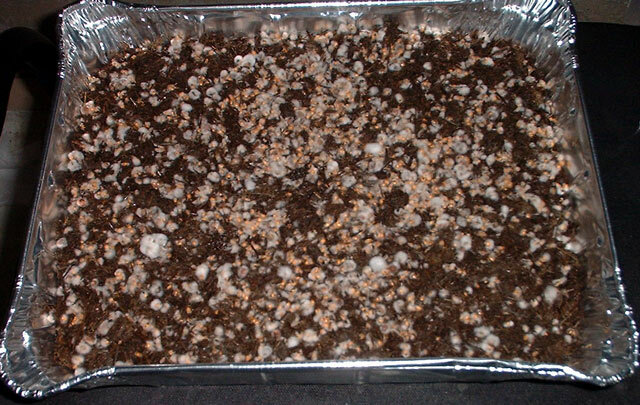 This tray was in the fridge for 2 or 3 days i think. 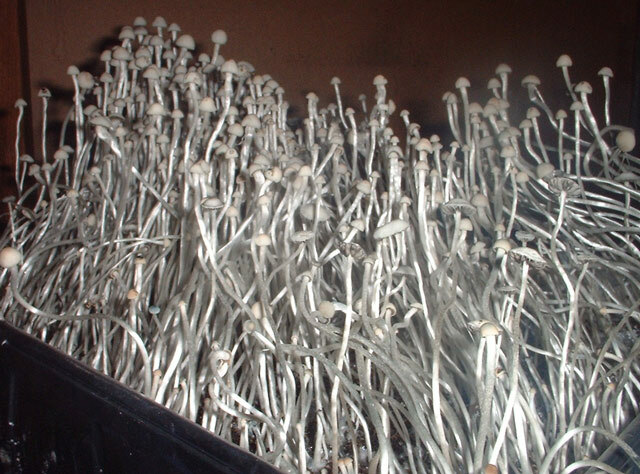 Then they are placed directly into the fruiting chamber, with initiation conditions. But anyway, I would much rather have your flush anyway. Your's are definitely bigger healthier and overall nicer looking! I don't think they look all that small. They look pretty tasty to me anyways. 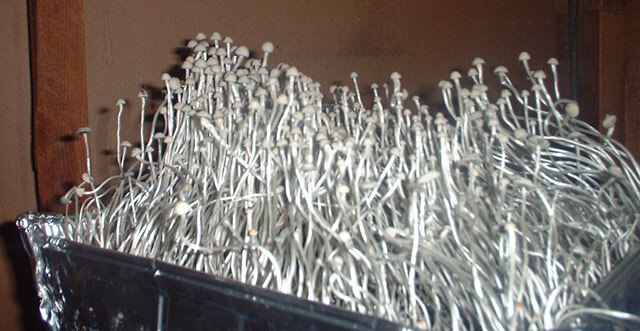 I believe the Pan-Cyans are my favorite shrooms that I've ever seen cultivated. There's just something about the way they look... Either way, congratulations and enjoy the fruits of your labors. 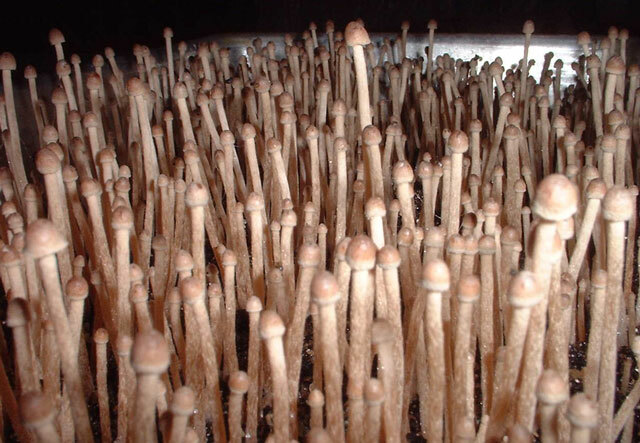 I found that they don?t like a high humidity after the pins are there. Hmmm. Dude will have to play with his setup some so he can drop his humidity that low. The way he has it, when the tape is covering the holes in his sterlite, the humidity is about 95, and after tape removal, it drops to a little under 90. So he'll tweak it a bit for the next flush. Okay, so you cold shock for a few days and you recase when you see stuff poke up though the casing layer? Is that all you do, no secret dance or prayer? 24,905 topic views. 0 members, 0 guests and 0 web crawlers are browsing this forum.